A preview of Game Two of the Texas/Toronto series. TEX: Bartolo Colon - 0-0, 2.59 ERA. TOR: Jaime Garcia - 2-1, 4.57 ERA. 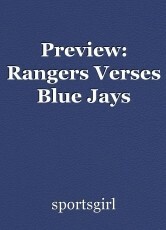 The Toronto Blue Jays want a better result this afternoon from last night's 6-4 loss to the Texas Rangers. It was Toronto's third straight loss. The Jays went down quickly 4-0 last night and battled back. Jay's starting pitcher, Marcus Stroman, had a terrible night on the mound, allowing eight hits and six runs. His earned run average is 8.88. The last time Garcia faced the Rangers was April 8. This page was created in 0.5156 seconds.